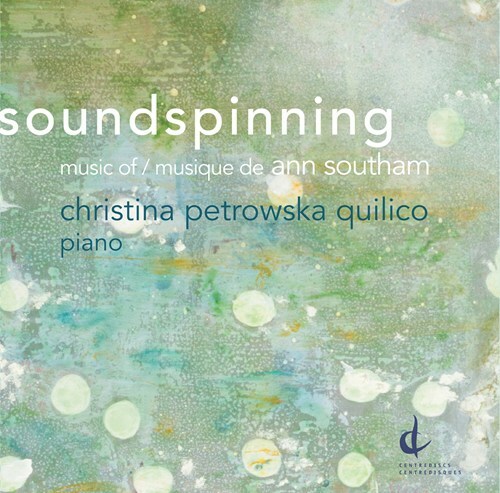 And to my happiness there is another volume of her piano music to hear, namely Soundspinning (Centredisques 26018), featuring Christina Petrowska Quilico and her sympathetic and idiomatic pianism. There are series of miniatures to be heard on this program, many most mesmerizing and singular in their clustering of motility, not typically repetitive in ways of some of the standard classical Minimalists. In other words these show some somewhat different sides of the Southam originality They are other glimpses at the Southam way. So there are the sort of clusterbomb dervishes that spin past our ears in the first part of the program. And then there are the series of short pieces with "blue" in the titles, which delve into blues-rock-jazz realms without being in any way direct lifts of the genre staples. If you do not know Southam's music at all, check my other CD reviews of her music in this column by typing her name in the search box above. You might be better served by starting with one of them first. Those who already know the earlier examples will nevertheless find this one illuminating and worthwhile. Maestro Southam is gone but most assuredly NOT forgotten. She was an original and her music still sounds great. So check her out. And hear this one for sure.